Okay, so I’m not too skilled at making even levels I guess. 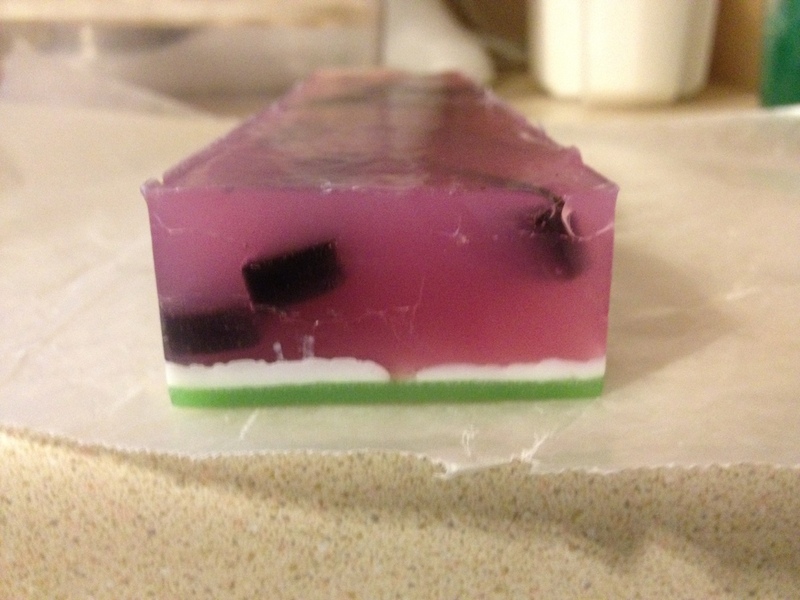 *grin* I’m letting the soap set awhile longer, but wanted to show the un-molded result. I think that the “seeds” look pretty good, although I need to scatter them a bit better and round the edges, since the squares are admittedly odd. It’ll make a decent little sample or thank you gift, I suppose, until I improve. I love how the “rind” turned out though, and the edges look kind of translucent, like edges of real watermelon. I’m sure that once I cut the middle slices won’t be nearly as bad as the end. Lol. I made a vow to post about my failures as much as my successes, despite how embarrassing they are, so there you are. It could have gone a LOT worse for a first try though. I think they look pretty good. I agree that rounding the edges would make the ‘seeds’ more realistic, and it’s too bad you don’t have a semi-circle mold so they would look like slices, but really they look pretty good.